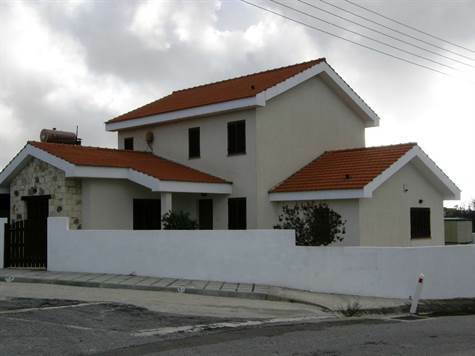 Peyia, Paphos - This stunning 3 bedroom 3 bathroom Eco-friendly, fully insulated villa was built using the Kingspan TEK building system. It is situated in the village of Pano Arodes on the edge of the Akamas National Park but only 10 mins. from Peyia and less than 20 mins. from Paphos. The villa sits on a corner plot which ensures maximum privacy. The villa enjoys stunning views across the Akamas to the sea as well as views of the Troodos Mountains. The home is fully insulated and has high specification fixtures and fittings. The villa sits on an easily maintained plot featuring mature raised beds and crazy paved patio areas around the villa. The Kingspan, TEK building sytem used features structurally insulated panels which ensures a building standard accepted by building control and insurance underwriters worldwide. It also means that the villa is warm in the winter and cool in the summer. At the rear of the house there is a separate utility/laundry room which is fitted with a stainless steel sink and has plumbing for a washing machine and a tumble dryer. At the side of the villa there is a car port and you can park two cars one behind the other with additional parking. Provision has also been made for the installation of a hot tub/Jacuzzi. High efficiency solar panels have been fitted ensuring that hot water is available nearly all year. This together with the in-built high specification 110mm. thick insulation means big savings on electricity costs and the house is very economical to maintain. The log burning stove also adds to the house's eco-friendly status as wood burning is carbon neutral and is considerably cheaper than fossil derived fuels. Wood is also a sustainable resource making the villa very eco-friendly. This villa is ideal as a holiday home or a permanent residence. Please refer to MLS#: 1385 when inquiring.